News « Welcome to Nyc The Site that Never sleeps! Welcome to Nyc The Site that Never sleeps! 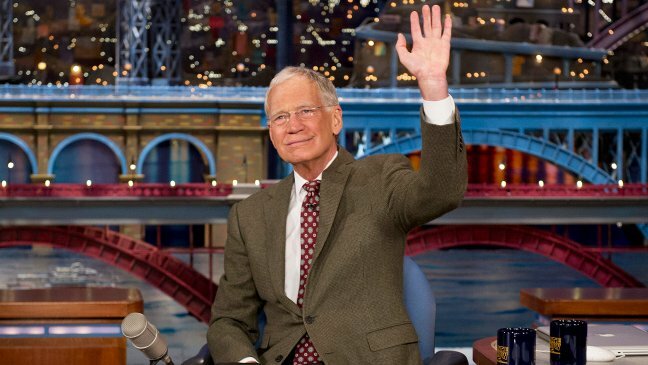 Yes…After 22 long years, David Letterman is hanging his late-night talk show up in 2015. He’s the only late-night talk show host to ever run over 2 decades , and he’s ready to give it all up to spend quality time with his son. Letterman made the announcement during the taping of his show Thursday in New York, telling the audience his last show will take place in 2015. Octomom might go to JAIL! The L.A. County District Attorney found Octomom guilty of welfare fraud for not reporting almost $30,000 in earnings last year from personal appearances and residuals from videos. she was charged with 3 felony counts of welfare fraud and now faces more than 5 YEARS IN PRINSON if convicted on all counts. The D.A. is asking the judge to set bail at $25,000. First thought that comes to mind for us is where will the kids go?! We’d hate to see 8 kids lost in the system! GROSS!!! 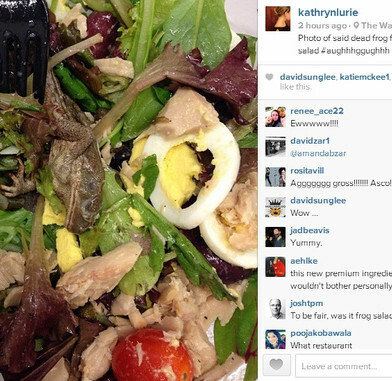 Dead Frog Found in Woman’s Pret a Manger Salad! Pret a Manger Brings the term Organic to a DIFFERENT LEVEL! Attention my fellow New Yorkers, if you work in the Midtown Area and you eat a healthy diet, you’ve probably visited Pret a Manger for lunch. That might change once you hear that a woman who ate there discovered a DEAD FROG in her Organic Albacore Tuna Nicoise Salad!! Wall Street Journal Digital Features Editor Kathryn Lurie posted the photo above to her instagram account. 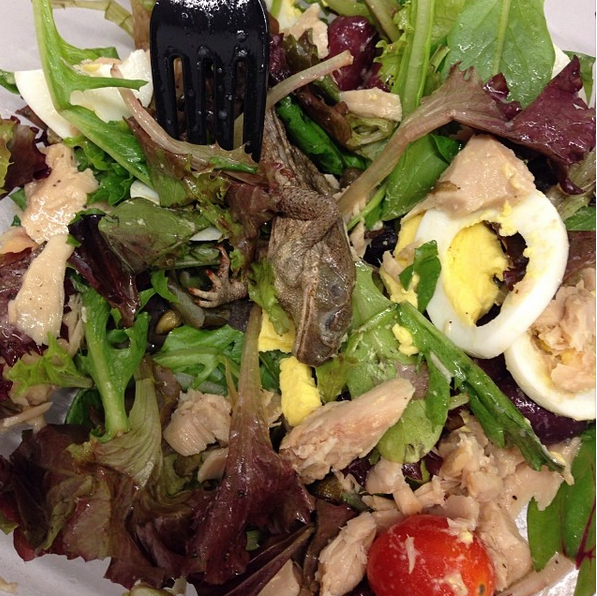 Luckily it wasn’t her salad but one of her co-worker’s lunch featuring the deceased amphibian. RIBBIT! “She was pretty shaken, understandably,” tweeted Lurie. 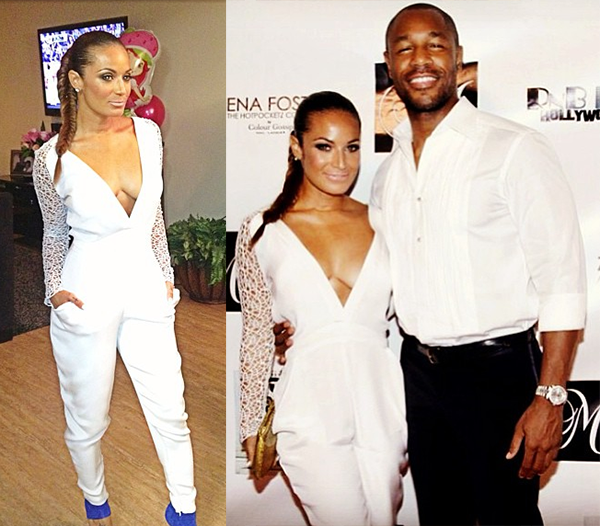 Tank Rekindles the Love for Former Girlfriend Zena Foster at Her Birthday Bash!!! 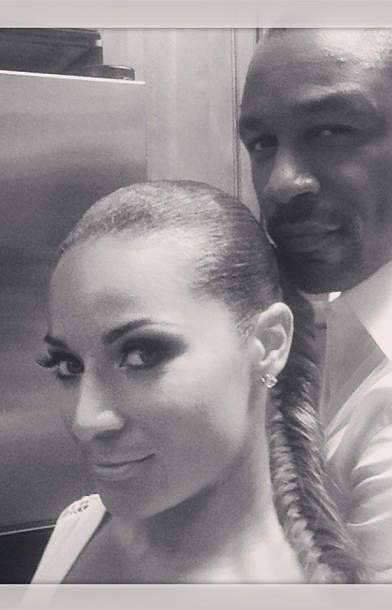 Tank has decided to give love another shot with the mother of his son Zena Foster. Last week the couple were spotted looking genuinely in love with each other as they took over the dance floor at Zena’s birthday celebration in Hollywood. 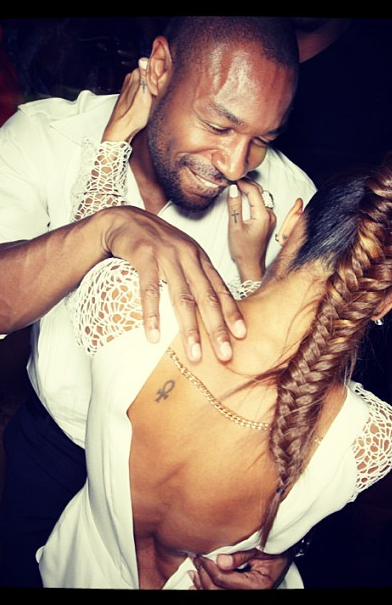 A source tells us that the two got back together when Tank hired her to be a dancer in one of his music videos. She loved his choreography so she eventually approached him! Naya Rivera Shows Off Engagement Ring!! The Glee Star Naya Rivera walked the red carpet of Latina’s Magazine’s “Hollywood Hot List” party and she had some very big news to boast about- Shes engaged to her dream guy Big Sean!! The couple met through a twitter exchange earlier this year and within 6 months quickly fell in love. Back in August , Big Sean expressed about Naya in an interview that she has been one of the most understanding people he has met and has helped make him a better person. Kanye West Lashes Out On Paparazzi For Showing Up at His House at 4a.m.!!!! Sometimes You Just Have To Give Them A Piece Of Your Mind! 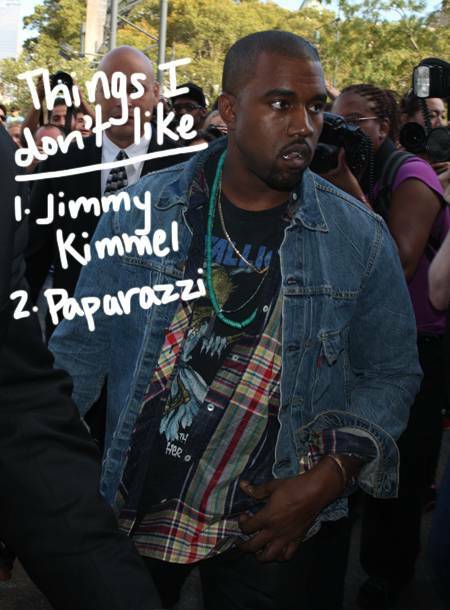 Poor Kanye and Kim…the paparazzi loves you two! It was about 4a.m. before the paparazzi showed up at Kanye West and Kim Kardashian’s home early this morning for photos and footage of the two leaving. They were at Kanye’s former bachelor pad where he was packing up the car most likely getting ready to leave town. It appears on a video that Kimmy was with him…possibly heading to Paris. Nicole Kidman Gets Hit By a Photographer On a Bike In NYC!!! Nicole Kidman was involved in an accident today, when a paparazzo on a bicycle came crashing into her! Nicole had just left the Calvin Klein show for NYFW and was returting to her hotel, when freelance photographer Carl Wu ran into her with his bike. Sources close to the incident revealed that the photographer slammed into her, causing the actress to come crashing to the ground!